Go on a classroom adventure to get ready for the first day of school, exploring the day from start to finish. Teaches 15 school readiness and critical thinking skills: familiarity with the classroom, school routines, days and seasons, cooperation and more. 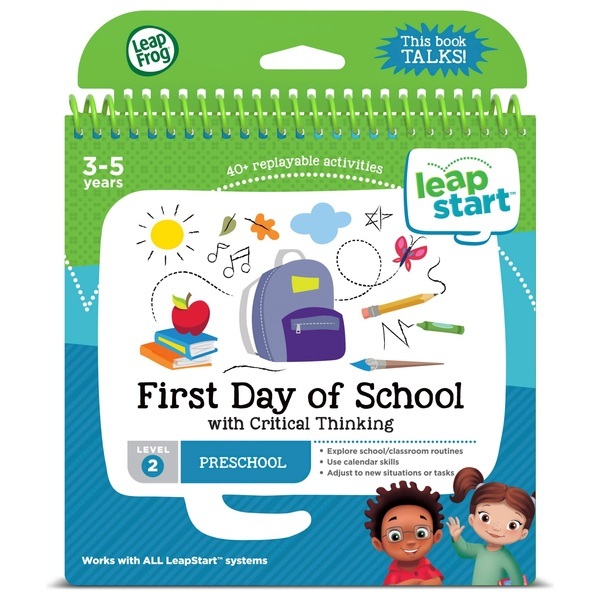 LeapFrog LeapStart Preschool Activity Book: First Day of School and Critical Thinking is an interactive, activity book that talks, sings and comes to life with 30+ replayable activities covering Preschool fundamental core and life skills from the First Day of School to Leadership. The first day of school is a big day, and this book guides your child from start to finish, helping them prepare. Meet new friends and learn about getting to school safely with a fun safety rules sing-a-long. Be the classroom helper and show kids around, pack a healthy lunch and go on field trips around town. When the school day ends, it’s time to clean up—race the clock to make cleaning up fun! With this LeapStart book, kids explore 15 school readiness and critical thinking skills, including using words to solve conflicts, taking turns, understanding days, months and seasons, working cooperatively and more. Activities are designed around familiar school activities like music time, circle time, recess, an even a science fair to help kids understand and be excited for their first day of school.